Israel began as an outgrowth of the Khazarian Supremacy long before the fake-state of Israel was created. Today ‘Israel’ is the premier military base and spear point for the Rothschild’s final push toward Full Spectrum Dominance over the entire planet. Above is the crude outline of what was their initial attack upon the Middle East which they still call “The Greater State of Israel”. This has been going on since long before 1948 and their criminal-slaughter of the Palestinians—yet today they have still not formally been able to add anything except the Golan Heights to the original State of Palestine: Despite nearly total funding by the USI. Because of their repeated failures to expand what was originally Palestine: Israel is fast approaching the very real failed status of the Failed-State that Israel is today, in everything but the name. “The story of the Irgun and Lehi (the Stern Gang) is a story of in-fights, splits, and splinter groups due to a constant and steady growth of militant radicalism in Zionist currents. It begins with the first Jewish Para-Military Group in Pre-Israel Palestine. The Hagenah. Prior to the 30’s the Hagenah was a fairly rag-tag, disorganized group. More of a militia that anything. Following the 1929 Palestine riots, in which 116 Arabs and 133 Jews were killed, the Hagenah became a much larger, well organized force. The espoused policy of the Hagenah (which means “Defense”) was primarily one of restraint. However there were those in the organization who had other ideas and in 1931 a group of Hagenah commanders formed their own group, “Irgun Beth.” In 37, during the Arab riots, Irgun Beth itself split and half its members returned to the Hagenah. The remaining members changed the group’s name to “Irgun Zeva’i Le’umi” (abbr. Etzel). After forming, the Irgun carried out attacks against both Palestinian Arabs and British Soldiers. Some were shooting attacks. Other attacks involved bombs being detonated on buses, in cafes and in marketplaces to ensure the maximum number or civilian casualties. The Irgun is responsible for the deaths of hundreds of Palestinian Arab civilians and British Soldiers and Police. Its violence and ruthless tactics prompted the Irgun to be condemned as a terrorist organization by the UN and the US and British Governments. Check out the vintage New York Times reference an Irgun attack. -July 26, 1946 The bombing of the King David Hotel, killing 91 people. -July 25 1947 The kidnapping and brutal murder of 2 British Sergeants. -April 1948 Deir Yassin Massacre in which 107-120 Palestinian Villagers were killed. In 1948 Albert Einstein & 27 Jewish intellectuals wrote a letter to the New York Times condemning the Irgun and its activities. 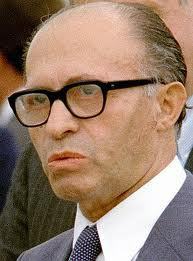 They also took a moment to call the former Irgun Commander, Menachem Begin, a Fascist. Note this in the last paragraph. Well, it’s a good thing that Fascist Begin never got any power…. wait a minute! kirwan: Israel today is not a democracy but an Apartheid, terrorist military-political-base in which only Zionists have any standing—Jews, Catholics, Christians, Muslims and all other religions have no standing whatsoever. From these ‘beginnings’ outlined above it is easy to understand just how ‘terrorism’ was able to move from an ancient action by some dissident religious factions in history, to the constantly changing global-threat that it has become today. Given the trillions upon trillions that the world has thrown away ­ on supposedly “defeating terrorism”: Is it not time for a worldwide conference on the Origins of Terrorism in the Modern Era? Part of the problem of course stems directly from the fact that the creation of Israel was synonymous with the twisted-birth of the criminally-created United Nations, which is why the UN has remained useless in either investigating or charging Israel with any of her crimes since it was created in 1948. The International Criminal Courts and the IAEA also have similar problems when it comes to monitoring, investigating or criminally charging Israel, as those institutions also answer to the same Rothschild’s monetary control that has ruled the world since before World War One. 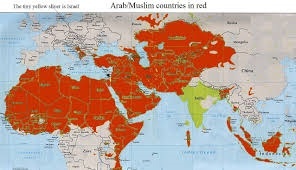 Their next major target along with the USA will be the elimination of all the Arab-Muslims. Shown above in RED. Of course ‘nothing ever goes as planned for these global-butchers of humanity, so it’s doubtful they’ll get the chance to make much more headway on this map, before the whole criminal enterprise called “ISRAEL” comes crashing down upon the rest of the planet. To condemn and evict the Khazarian Supremacists from the planet. From every nook & cranny in this star-crossed place. The roots of Modern Terrorism.